Digital technology is transforming the musical score as a broad array of innovative score systems have become available to musicians. From attempts to mimic the print score, to animated and graphical scores, to artificial intelligence-based options, digital scoring affects the musical process by opening up new possibilities for dynamic interaction between the performer and the music, changing how we understand the boundaries between composition, score, improvisation and performance. The Digital Score: Musicianship, Creativity and Innovation offers a guide into this new landscape, reflecting on what these changes mean for music-making from both theoretical and applied perspectives. Drawing on findings from over a decade’s worth of practice-based experimentation in the field, author Craig Vear builds a framework for understanding how digital scores create meaning. He considers the interactions between affect, embodiment and digital scores, offering the first comprehensive and critical consideration of an exciting field with no agreed-upon borders. Featuring insights from interviews with over fifty musicians and composers from across four continents, this book is a valuable resource for music researchers and practitioners alike. 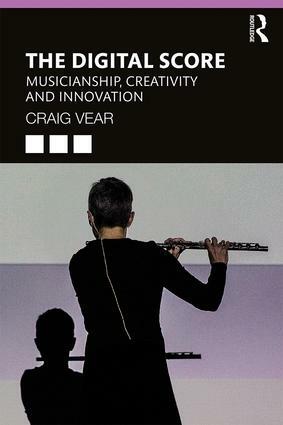 Craig Vear is Professor of Digital Performance and Music at De Montfort University, UK.